These days, locks operated by cylinders (commonly referred to as 'lock barrels') are becoming more and more popular due to the diversity and scalability cylinder locks offer, both in terms of security and practicality. When it comes to security, if we look at the basics of how cylinders work, using different length pins which sit into the grooves on the key, these days using six different cuts, and normally around 10 cut-depths on each, the amount of differs available is substantially greater than that of most lever-based locks. And that's just the beginning. Once you start looking at high-security cylinders (such as our high security EPS cylinders), you start getting anti-pick, anti-bump and anti-drill features, along with a whole host of different defence mechanisms in place against common manipulation methods. In addition to this with our EPS range you get protected registered keys which only you can have cut, so you can maintain the security of your keys too. When it comes to master-keying, we're building master key cylinder systems for companies and individuals on a daily basis. To us it's second nature, but if you're unfamiliar with how they work and you want a more in-depth look at master key systems, then please have a look at this video and article we have put together explaining how master-keys and master key systems work. 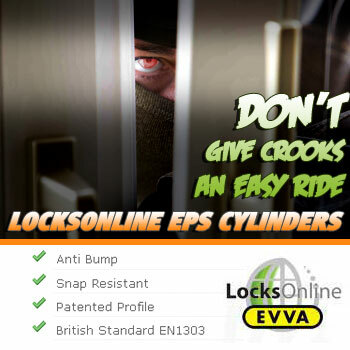 LocksOnline are pleased to offer the complete range of Evva Security Cylinders. These include the Evva 3KS, Evva DPS and Evva MCS. Other Evva ranges are available on special order. The Evva cylinder range ensure the necessary levels of protection and security for all locks in buildings and facilities. If you have a particular requirement or would l.. Need a economical master key system but not sure where to begin? Don't know exactly how many or what you need to order? Not too sure what a master key system is? Let us help! We don't bend you to the system, we bend the system to you. Master Key systems allow you to create a suite of locks that have varying levels of access for different key hol.. If you need help measuring or finding out what cylinder you need to replace an existing or install as new. Then we're here to help! Check out our handy little guide to measuring...and it doesn't cost a penny! Bargain!.. Get maximum-security anti-pick, anti-bump, anti-snap, anti-drill cylinders with a restricted & patented key profile for your doors! Don't take a chance, get your home or business secured today! Click here to go digital!